The Reference Series 5.1 Surround Sound System encapsulates you with every sound the way the artist intended. 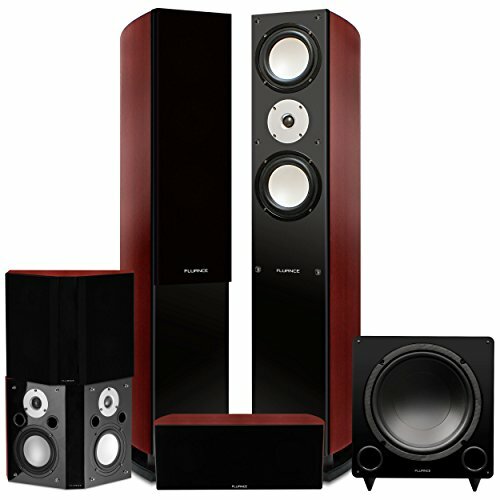 This home theater system includes floorstanding tower speakers delivering full range sound, a center channel speaker to accentuate crisp vocals, and bipolar speakers for enveloping 3-dimenstional sound allowing you to experience the highest symphonic crescendos to the deepest smoothest jazz. Not Just Speakers. They're a Lifestyle. This speaker provides superior performance at every volume level with outstanding precision and clarity, allowing you to soak up all the dramatic impact your music and movies can deliver. From the lowest, sexiest bass beats to the wildest explosions, you will feel every rumble. The Loudspeaker's down-firing subwoofer has been carefully designed to achieve maximum low-frequency effect for a heart-pounding bass performance. Eloquent speeches and crystal-clear sound effects will radiate from the midrange drivers of the Reference Series. An essential component of any high-performing speaker system, the midrange drivers are responsible for the sounds that are most easily recognized by the human ear, making every detail come to life. Every exhilarating cymbal clash and every spectacular trumpet note will soar high and bright. Our superior tweeters produce high frequencies with captivating clarity at even the highest volume levels. Controlled, smooth and never too aggressive, your home theater system will deliver the high notes perfectly. The cabinets are precision crafted with engineered MDF wood to create a warm, distortion-free sound. Combining the striking exterior features of the black wood grain finish, and glossy piano-black front baffles with the premium components will mesmerize listeners for a holistic surround sound experience. Powerful 12" Subwoofer - Low distortion amplifier provides continuous 240 watts of clean, dynamic power (400w peak) to deliver heart pounding bass at the most intense music and movie climaxes.